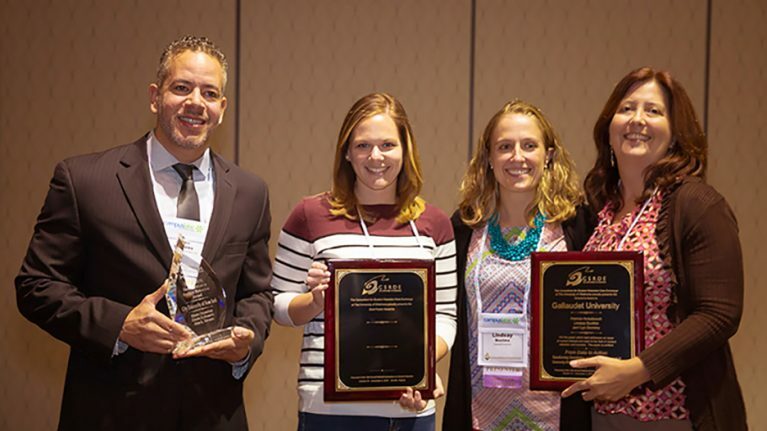 Salt Lake City, UT – The Consortium for Student Retention Data Exchange (CSRDE) at the University of Oklahoma presented four awards during the recent Fourteenth Annual National Symposium on Student Retention (NSSR) held in Salt Lake City, UT. 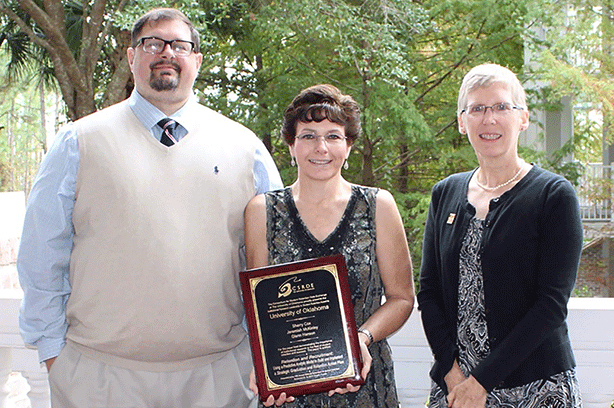 The 2018 Best Practices Award was given to Murray State University for the paper “Student Engagement and Success: Action and Assessment” by Peggy Whaley, Cindy Clemson, and Jeff Henry. Best Practices Award winners must demonstrate evidence of a system-wide approach to the institution’s retention issues. Murray State University has implemented student success discipline-specific freshmen transitions courses in which academic affairs and student affairs personnel collaborate as partner instructors. 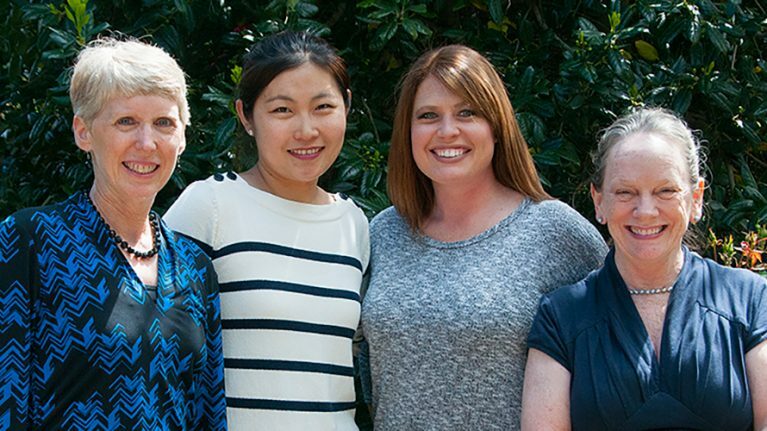 Faculty who are assigned to teach their disciplines’ one-credit-hour transitions course are paired with student affairs, library, or graduate student volunteers. Discipline faculty deliver discipline-specific content and the success seminar instructors deliver content on time management, strategic learning, resiliency, managing college life, grit, growth mindset, and successful student behaviors. 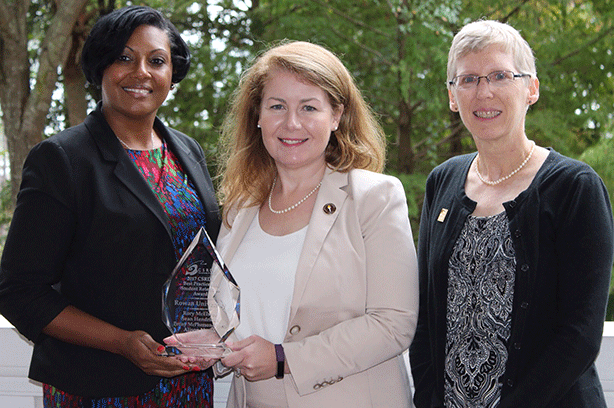 The University of South Carolina won the Institutional Research Leadership in Student Retention Award. The paper, “Academic Work Ethic as an Enrollment Management Measure,” was written by Phil Moore and Marla Mamrick. This award is given to the paper best demonstrating the importance of institutional research to the field of student retention. The paper investigates using a measure of academic work ethic derived from admissions test scores and high school GPA to detect students at-risk. The group of students with low academic work ethic is less likely to return each year and is less likely to graduate. Academic work ethic also appears promising when used with existing admissions decision indexes and can lead to higher retention and graduation rates and an increase in enrollment numbers for minority, Pell eligible, and in-state students. 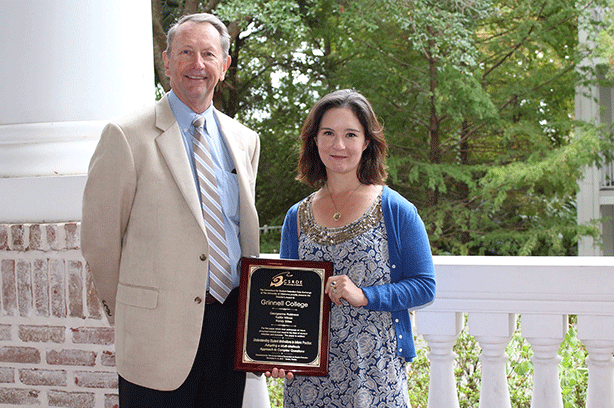 The Director’s Award, which is given to the paper that best addresses an issue of current interest and need in the field of student retention and success, went to the University of Alabama for “Reading Between the Retention Rates: Examining First Generation Student Transitions in the First Year.” Amy Bickel wrote the paper. It uses qualitative methods to examine participants in the Legacy Scholars program focusing on their transition, growth, and recommendations for institutions of higher education. The themes that emerged describe high levels of pressure, an understood knowledge gap, the importance of social community, threat of financial barriers, and suggestions that can inform our practice in serving this growing population. 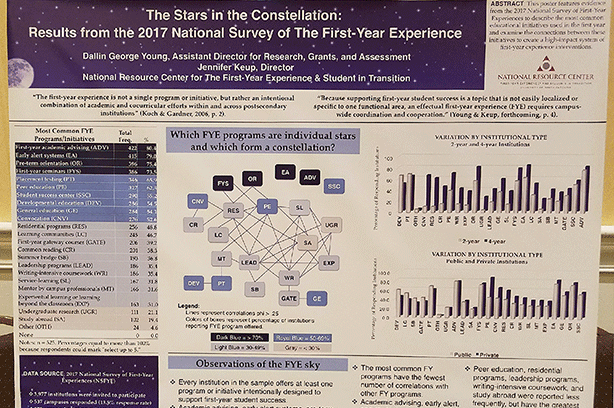 New Jersey City University won the Best Poster Award for “Identifying Challenges and Improving Outcomes for First-Generation and Low-Income Students.” Jimmy Jung and Veronica Garcia created the poster. Conference attendees who volunteered as judges chose the winner on-site. The Fifteenth Annual National Symposium on Student Retention will take place October 28-31, 2019, in New Orleans, LA. The CSRDE begins accepting proposals for consideration in late January. Information will be posted as it becomes available on the CSRDE website (https://csrde.ou.edu). The CSRDE has a diverse membership of colleges and universities—two- and four-year, public and private—with the common interest of achieving the highest levels of student success through sharing data, knowledge and innovation. It is operated by the Center for Institutional Data Exchange and Analysis at the University of Oklahoma Outreach. You can drop off your book at the NSSR Registration desk during the conference. NSSR offers considerable benefits to attendees that will be sure to aid you in your efforts to increase student retention at your colleges and universities. If you are ready to take advantage of our unique sharing of experience and knowledge, the next step may be to convince your business office of the value NSSR will bring to your institution. With keynote speeches from field experts, round table discussions with colleagues nationwide, and many diverse opportunities for networking, NSSR helps attendees to gain useful skills and make important contacts for the future. – Information that an attendee gains at NSSR can be brought back to the university and shared among colleagues. – All attendees receive digital copies of the NSSR proceedings with all peer-reviewed papers. – NSSR is less expensive than many conferences. – NSSR presentations have shown that student retention has a direct impact on improving the financial status of colleges and universities. – NSSR’s intimate size and focus on networking are designed to promote collaboration and create long-term key contacts. CSRDE has created a justification letter template for presentation to supervisors. This document both further explains how your university can benefit from your attendance and includes a worksheet which will help estimate costs. Register by September 1st to receive an Early Bird discount! Check to see if your school is already a member or consider an individual membership. CSRDE members receive discounts of $100 on attendance. CSRDE created Building Bridges for Student Success: A Sourcebook for Colleges and Universities in 2013. There are so many complex issues involved in post-secondary education, we felt the need to enhance the bridges between its activities, functions and programs. We designed the publication to be dynamic and to incorporate the latest resources for student success. The Sourcebook continues to grow and adapt. Flexibility is key to providing an outlet for the expanding body of knowledge within the higher education community. We are opening the process to create a more responsive structure and include more voices. Authors may now submit manuscripts throughout the year. The Call for Manuscripts includes links to the guidelines and documents needed for the submission process. In the beginning, manuscripts were all first reviewed by the editors. To make the process more fluid, CSRDE is forming a panel of reviewers. Members will provide input for editors and authors to help identify and prepare manuscripts for publication. Each reviewer is asked to commit to a 3 year term on the panel. During this time, they will periodically be contacted to review manuscripts. The Consortium is accepting applicants through 5/21/18. We will consider experience, willingness to provide input and area of expertise as factors for appointment. Find more details and links to all relevant information in the Call for Reviewers PDF. The idea for the Sourcebook was first conceived by Gerry McLaughlin, Richard Howard, Josetta McLaughlin and William E. Knight. The four helped the Consortium create the publication and served as editors for its first five years. 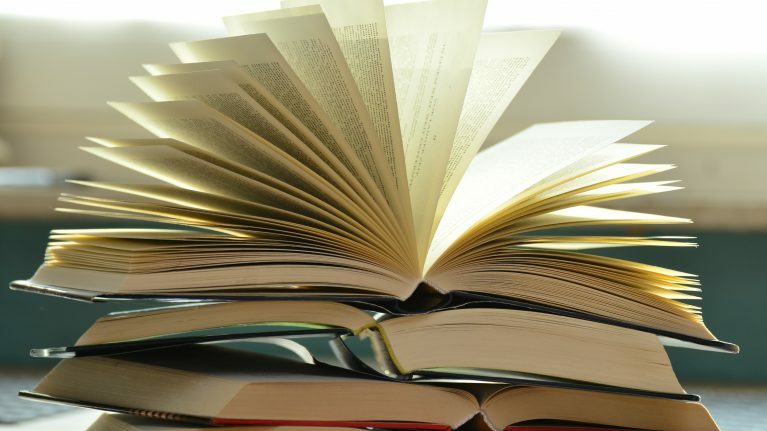 To date, it includes five parts with 31 chapters written by 70 higher education professionals. See an outline of the material here or check the purchase site for more details. Using the new framework, we will continue to enhance bridge-building and cooperation in higher education for many years to come. The current editor of the publication is Julie Noble. Jane Zeff and Anne Edmunds Aguirre are associate editors. As Director of the Consortium, Sandra Whalen continues to oversee the project. Find out more, including purchasing information, on the Sourcebook page. We request evaluations each year to help make the National Symposium on Student Retention a more productive experience and added a prize drawing last year. Attendees completed the evaluations electronically, using our NSSR Guidebook app and Qualtrics. Last week we used an Excel random selection process to choose the winner from the 2017 Symposium evaluations. Stacie Grisham won free registration for our 2018 Symposium in Salt Lake City. 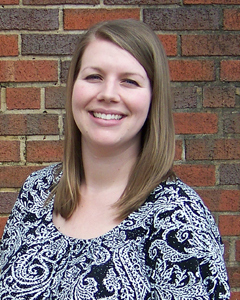 She is Director of the Center for Advisement at the University of Tennessee at Chattanooga. #NSSR18 will take place November 5-8. Stacie’s prize includes payment for the 3 days of concurrent sessions. We got plenty of feedback and, as always, we listened. People keep asking for more time, so we are adding another half day to the conference for a total of three full days of consecutive sessions. Professional Development is the top reason our colleagues come to NSSR. From the Monday pre-conference workshops to the last sessions Thursday, attendees can earn up to 3.2 CEUs. They request the certificates during the evaluation process. Networking is intrinsic to professional development. We do everything we can to create an environment conducive to communication between colleagues of all branches and levels of higher education. Thank you for another transformative professional development and networking experience. NSSR is unmatched. We get constructive criticism, which we appreciate, but we also get enough compliments to make us collectively blush. We know we aren’t supposed to brag, but 99% of our 2017 respondents would recommend NSSR to a colleague. This was my first time attending the NSSR conference and I was very impressed. Great opportunities to learn and network with colleagues and the presentations were thought provoking and relevant to my work in student retention. I would highly recommend! Our goal is for your investment in the Symposium to reap maximum returns in actionable information, quality and relevance. To that end, we continue to ask for and listen to your suggestions and we set high standards for all our presentations. The variety of topics, institutions, and levels is outstanding and so helpful. I always take away such great ideas from this conference to implement in my area at my institution. See you in Salt Lake City! Norman, OK – The Consortium for Student Retention Data Exchange (CSRDE) at the University of Oklahoma is now accepting proposals for its 2017 National Symposium on Student Retention (NSSR), to be held November 6-9, 2017 at the Sandestin Golf and Beach Resort in Destin, Florida. CSRDE is seeking proposals on programs and research that can help institutions of higher education address critical issues affecting student retention and success. Topics may include evidence-based research or case studies on innovative programs targeting general or specific populations, interdisciplinary best practices, and ideas for improving success through technology. The Symposium is committed to offering a complete educational experience on post-secondary retention and graduation to a diverse audience. It promotes the integration of innovations in student success across entire institutions by encouraging networking and collaboration. All papers presented at NSSR go through a multiple stage review process and are published in the conference proceedings. Researchers, administrators, practitioners and academics interested in presenting at the event should submit an abstract by March 20. Authors of accepted submissions will be invited to write a paper for peer review no later than May 22. Papers that score sufficiently high in the review process are accepted for presentation at the symposium. In addition to all papers being published in conference proceedings, they are also considered for the following prizes: Best Practices in Student Retention Award ($2,000); Institutional Research Leadership in Student Retention Award ($1,000); and the Director’s Award ($750). 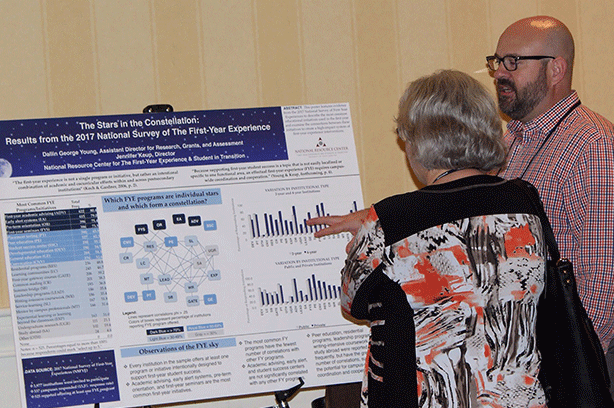 Poster submissions are judged on-site for the Best Poster Award ($500). All published papers are archived online in the CSRDE Knowledgebase. The Consortium for Student Retention Data Exchange has a diverse membership of about 400 colleges and universities and is coordinated by the Center for Institutional Data Exchange and Analysis (C-IDEA) at the University of Oklahoma Outreach. As well as compiling four annual retention reports for the members of the consortium, C-IDEA is the program evaluator for the Oklahoma Louis Stokes Alliance for Minority Participation (OK-LSAMP) program, which is funded by the National Science Foundation. The complete Call for Proposals may be downloaded from the CSRDE web site (csrde.ou.edu) where more detailed information on the symposium and other consortium activities is available. 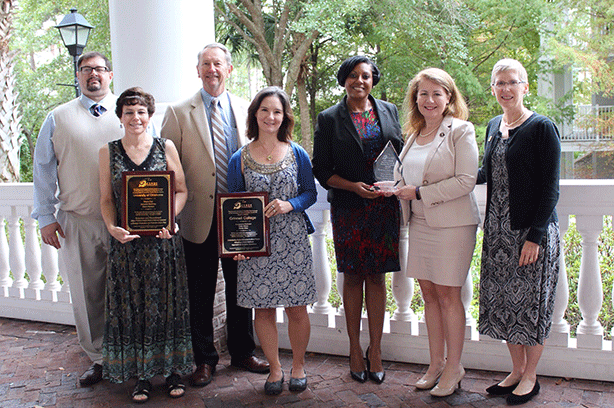 Norfolk, VA – The Consortium for Student Retention Data Exchange (CSRDE) at the University of Oklahoma presented four awards during the recent Twelfth Annual National Symposium on Student Retention (NSSR) held in Norfolk, VA. The 2016 Best Practices Award was given to City University of New York (CUNY) for the paper “CUNY Accelerated Study in Associate Programs (ASAP): Evidence from Six Cohorts and Lessons for Expansion” by Diana Strumbos, Zineta Kolenovic and Alex L. Tavares. Best Practices Award winners must demonstrate evidence of a system-wide approach to the institution’s retention issues. The CUNY program supports associate degree-seeking students and has been successful at reaching a three-year graduation rate of more than 50 percent, more than double that of the comparison group. ASAP has now received funding to enroll 25,000 students by 2019, targeting more STEM majors across nine of their colleges in the next three years. The paper describes how research and evaluation inform program management. The University of Kentucky was awarded the Institutional Research Leadership in Student Retention Award for the paper “Need-Based Financial Aid Strategies to Promote Student Success” by Todd Brann, Bethany L. Miller and Craig Rudick. This award is given to the paper best demonstrating the importance of institutional research to the field of student retention. Using predictive modeling techniques, the University of Kentucky found unmet financial need to be one of the best pre-matriculation variables they have for predicting second-year retention of first-time undergraduates. This drove UK to develop a grant program for students in financial distress. UK is also exploring options for adding comprehensive need-based aid to their financial aid program, which was historically almost exclusively merit-based. The Director’s Award went to “From Data to Action: Transforming Quantitative and Qualitative Research to Community-Wide Action for Improvement in Equity Outcomes,” as the paper that best addressed an issue of current interest and need in the field of student retention and success. This paper, written by Patricia Hulsebosch, Lindsay Buchko and Jerri Lyn Dorminy of Gallaudet University, documents the process of transforming data to action for their students of color. These actions include data collection and analysis, associating the findings with student success literature, sharing the results with the university community and preparing for action. The Best Poster Award, chosen on-site, was given to Kent State University for “FLASHperks Rewards Program,” a poster designed by Kristan Dolan and Katie Goldring. FLASHperks is a university-wide initiative to enhance student involvement on campus and increase retention rates. The Thirteenth Annual National Symposium on Student Retention will be held November 6-9, 2017, in Destin, FL. The CSRDE begins accepting proposals for consideration in late January. Information will be posted as it becomes available on the CSRDE website (https://csrde.ou.edu). Two months ago, a contact person at one of our member system offices requested our help with two projects. They were looking at re-baselining their graduation initiative goals based on national comparative peer data (as required in 2016 state legislation) for first-time, full-time cohorts and transfer cohorts from two-year institutions. Institutional-level data were needed to inform the discussions of their trustees, campus presidents, provosts, and others tasked with developing comparison groups and updating student success goals. The system office recognized that CSRDE held the only national source of transfer cohort outcome data, and that available CSRDE freshman cohort outcome data provided a more recent lens on four- and six-year graduation outcomes than data available from IPEDS sources. We responded and sent the details they needed within just a few days of releasing our 2016 CSRDE Retention Report, giving them the latest data to use for their analyses. On a smaller scale, a member recently requested data that was grouped differently than presented in our annual report. We sent her the few data points she needed so she could report it to her boss, who was to share it with the Provost and Chancellor at her university. In both cases, we helped our members meet their data needs by creating custom reports. Typically, however, members are able to fulfill requests by creating their own custom peer reports using our Online Quick Query System and the data given in the four annual reports. If a faculty member applies for a grant in the STEM disciplines and needs national data for the proposal, participating institutions have the numbers at their fingertips. If the institution seeks data on how their community college transfer students are progressing compared to other institutions, a look at that report will give them what they need. But when they need more, we are here to assist. Let us help you with your data requests! Learn more about our reports and request a member packet, or feel free to email or call us anytime with your questions. Ready to Attend NSSR but Need to Convince the Business Office? Are you ready to attend the Symposium, but need help convincing leadership to pay for it? Travel and training budgets have been slashed at education institutions across the country with some experiencing severe financial problems. We understand that the cost of attending a conference is considerable and that your business office may want some serious justification. NSSR is more affordable than many other conferences, gives a great return on investment and the smaller, more intimate size is designed for interaction & collaboration among colleagues who may serve as key contacts for future initiatives. We have created a justification letter template for your supervisor or business office. It explains the benefits you and your school will get from attending and includes a worksheet to help estimate the costs. Remember to register by September 1 for the Early Bird discounts! All faculty and staff at CSRDE institutions receive additional discounts on conference and workshop registration so check to see if your school is a member. If not, you can still qualify for the member discounts by becoming an individual member.